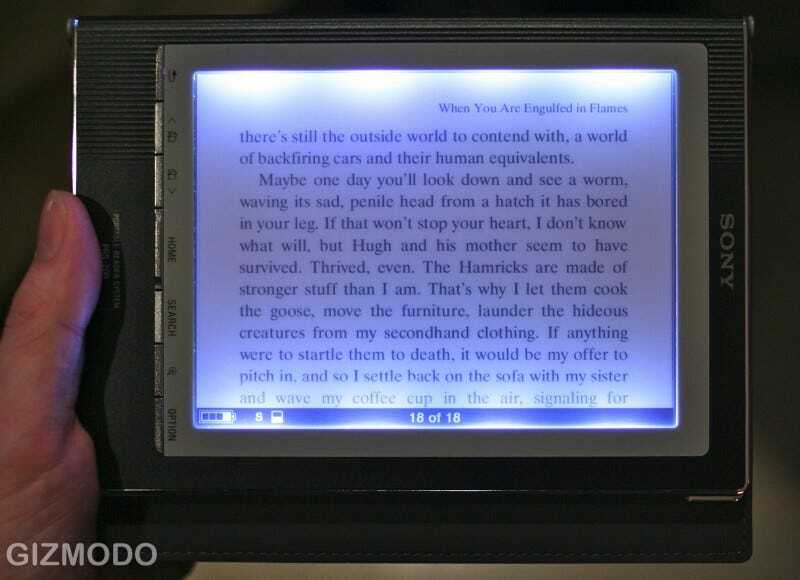 Sony brought out a new Reader tonight in NYC that adds a six-inch touchscreen to the e-ink e-reader for adding notes and annotations, as well as a redesigned case and built-in frontlight. With the touchscreen readers can enter text with a stylus on a full-screen QWERTY keyboard to add notes and annotations, search for specific phrases or just flip through the page with a stylus or finger swipe. It'll hit at the end of October for around $400. Hit the jump for more impressions. Text gets entered by tapping an on-screen QWERTY. Highlighting seems easy enough-just drag the stylus over the phrase you want to highlight. You can then easily search for that phrase elsewhere in your book. You can also tap the screen with finger or stylus to zoom in and out of pages. Format support is the same as previous readers, with the same added .epub support. SAN DIEGO, Oct. 2, 2008- With the latest edition of Sony's Reader Digital Book, announced today, readers can truly let their fingers do the walking. An interactive touch screen display allows for the most intuitive digital reading experience to date. The new model, PRS-700, will join the PRS-505 model in the Reader family to give consumers a choice of how they would like to read electronically. Svelte and stylish, the newest Reader still sports the dimensions of a slimmed down paperback book. The textured black casing and soft black cover contribute to its envy-inspiring design. And, at about 10 ounces, it's the perfect way to carry all of your favorite books with you wherever you go. A sizeable six-inch display with touch screen capability allows booklovers to flip pages with the slide of a finger. In addition, readers can easily search terms within a document or book, create notes using the virtual keyboard and highlight text with the included stylus pen. Five pre-set text sizes are available so readers can find the one most comfortable for them and for those who need an even closer look, zooming in is as easy as tapping the screen. The device still features high-resolution, high contrast electronic paper display technology which provides a reading experience very much akin to ink-on-paper. The result is crisp text and graphics that are highly readable, even in bright sunlight. For times when ambient light is not available, Sony is the first to offer a built-in LED reading light. Expanded memory offers enough capacity to store about 350 average digital books. Using optional removable Memory Stick Duo media or SD memory cards, this Reader can hold literally thousands of books and documents. "Readers now have another choice in digital books," said Steve Haber, president of Sony's Digital Reading Business Division. "This new model has the eye-popping design and intuitive functionality that people have come to expect from Sony." Family Resemblance Like its close relative the PRS-505model, the new 700 model uses minimal power and can sustain up to 7,500 pages of continuous reading on a single battery charge. It supports multiple file formats for eBooks, personal documents and music. With the included eBook Library 2.5 PC software, you can easily transfer Adobe PDF documents with reflow capability, Microsoft Word documents, BBeB files and other text file formats to the Reader. The device can store and display EPUB files and work with Adobe Digital Editions software, opening it up to almost a limitless quantity of content. Improved Sony eBook Store Sony's eBook store will also have a new face. This month, a re-designed page layout with more prominent book cover art will improve the overall visual appeal of the site. A streamlined checkout process along with updated search and discovery make finding and purchasing an eBook a breeze. Pricing and Availability The new Reader will be available next month for about $400. It will come complete with a USB cable, eBook Library PC companion software and a color-coordinated, protective soft cover. Both the PRS-505 and the PRS-700 models along with their optional accessories can be purchased direct through www.sonystyle.com, at more than 40 Sony Style® stores nationwide and at authorized retailers across the country.